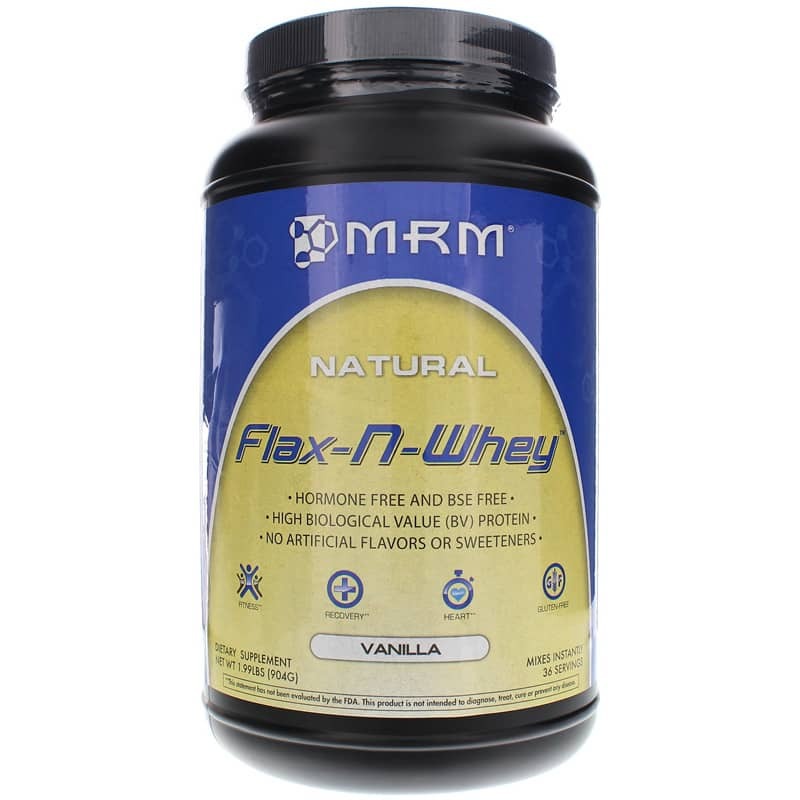 MRM Natural Flax-N-Whey Vanilla is designed to help modify or supplement your diet to compensate for the on-the-go convenience foods that make up much of the standard American diet (SAD). Low Carb diets, food supplements, and fiber additives to food or juice are balancing mechanisms against SAD. And this is where Natural Flax-N-Whey fits in. SAD is also considerably lower in omega-3 fatty acids than recommended levels. Omega-3 fatty acids (ALA) may help reduce the risk of coronary heart disease while improving cell communication and function. 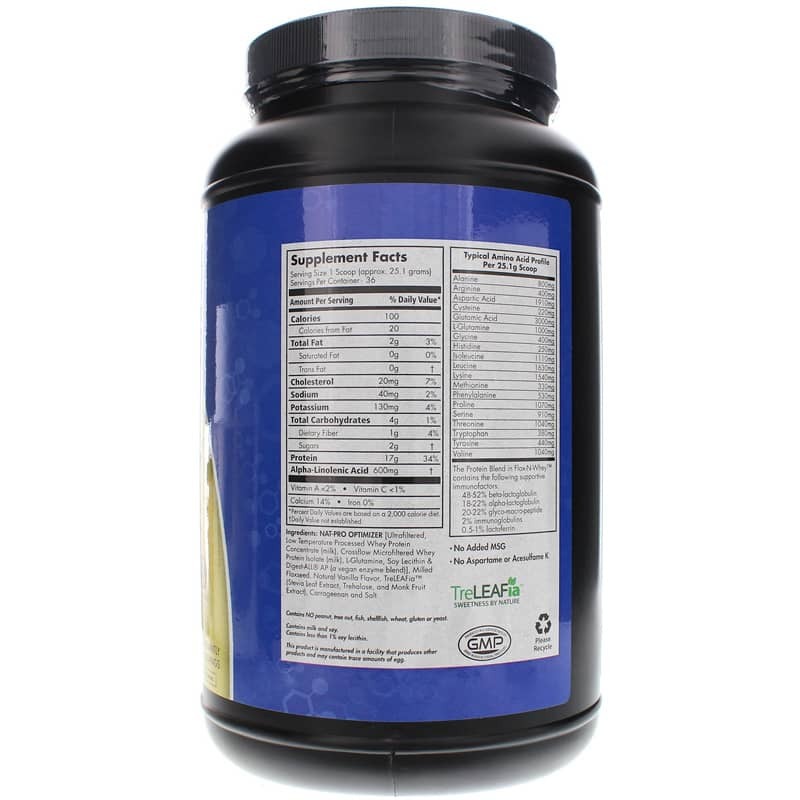 Flax-N-Whey contains solubilized flax meal to deliver 600mg of ALA, per serving. Natural antioxidants in flaxseed protect the stability of these essential fats. Omega-3 from flaxseed also contains high levels of phytoestrogens, known as lignans, which provide estrogen balancing support. Whey and flaxseed are also both sources of protein. Whey actually has relatively low protein, around 0.9 g per 100 g, but the body is very good at utilizing this source of protein. Flaxseed, meanwhile, contains around 2.8 g of protein per 14 g.
Flax-N-Whey provides the optimal source of whey protein by combining highly refined cross-flow micro-filtration and ion exchange processed whey. This specialized processing system insures a high quality protein source in the form of short and long chain peptides to increase protein retention, which provides a high biological value (HBV). Flax-N-Whey is also high in branched chain amino acids (BCAAs), which help with energy production, especially during dieting or when there is protracted times in-between meals. Energy production is further enhanced through the addition of Trehalose, a long lasting energy substrate, which does not affect insulin levels and minimizes fat storage. 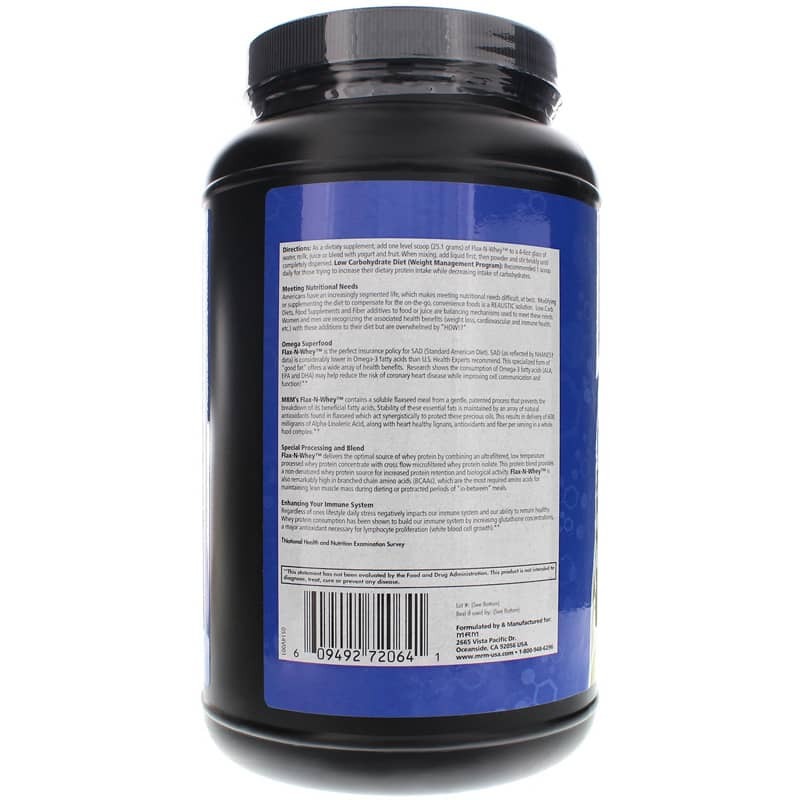 Ingredients: Nat-Pro Optimizer [ultra-filtered, low temperature processed whey protein concentrate (milk), crossflow micro-filtered whey protein isolate (milk), l-glutamine, soy lecithin and DigestALL AP (a vegan enzyme blend)], milled flaxseed, natural vanilla flavor, TreLEAFia (stevia leaf extract, trehalose and monk fruit extract), carrageenan and salt. Contains NO: aspartame, acesulfame K, peanut, tree nut, fish, shellfish, wheat, gluten, or yeast. Adults: Add one scoop (approx. 25.1 grams) of Flax-N-Whey to 4 to 6 ounce glass of water, milk, or juice or blend with yogurt or fruit. When mixing, add liquid first, then powder and stir briskly until completely dispersed.